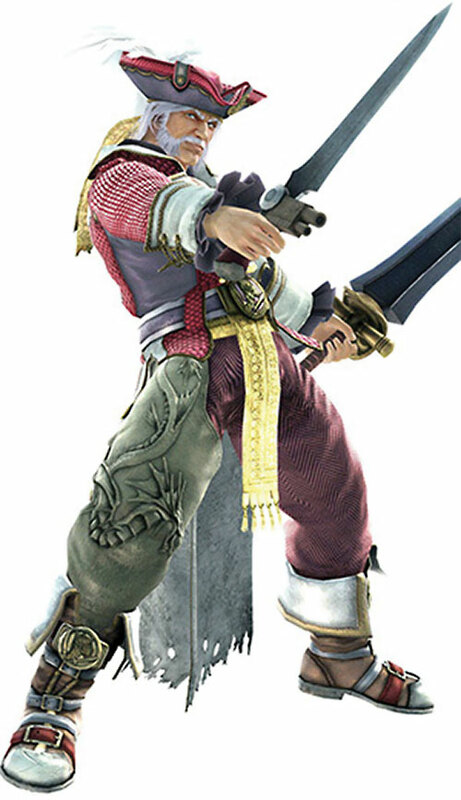 Sorel is one of the characters from a classic series of melee combat console video games, Soul Calibur. He was there from the beginning, with the Soul Edge game in 1995. 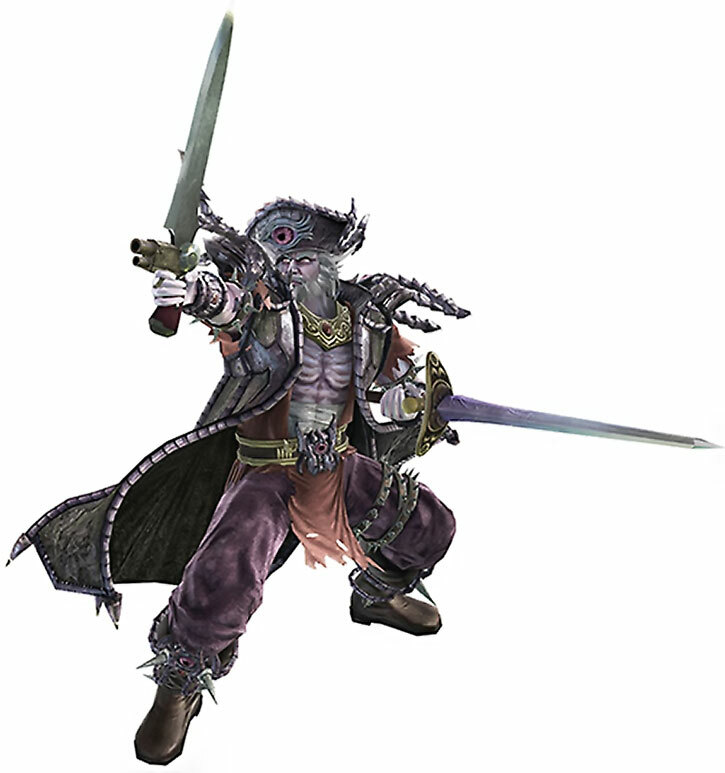 He’s the main bad guy who started it all in the Soul Calibur universe. He also fulfills the weird niche if a Gamemaster needs something original like a tough period zombie pirate with supernatural elements and an unholy quest. Other Aliases: The Immortal Pirate. Marital Status: Single, possibly NA. Known Relatives: Philip de Leòn (father, deceased), Unnamed mother (deceased), Isabella ‘Ivy’ Valentine (daughter). Group Affiliation: Cervantes’ zombie pirates. Height: 5’10” Weight: 176 lbs. Cervantes is a rather vicious pirate. In fact he’s probably the most vicious pirate in his era, perhaps even in the history of his universe period. 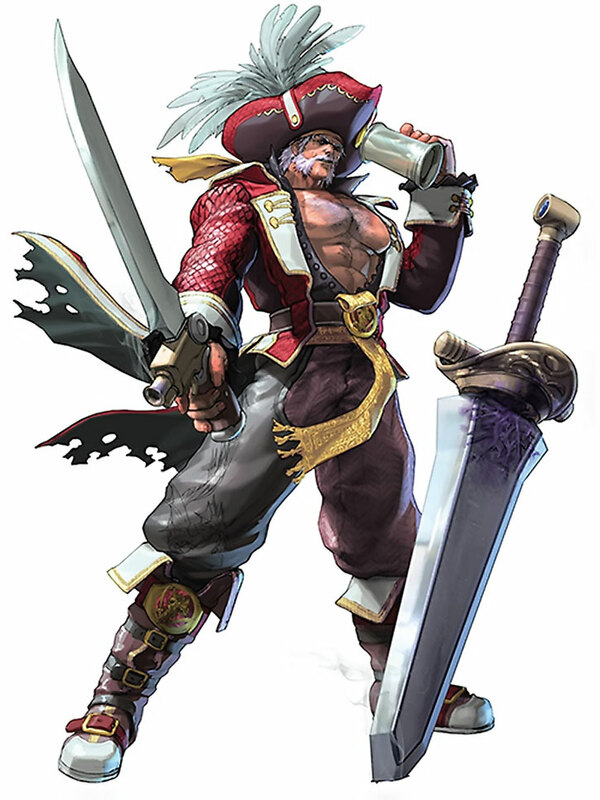 As such he has ample experience with murdering, looting, pillaging, etc.. He’s also a superior mariner and quite skilled at dual-wielding swords. Originally he was one of the most powerful warriors in the world. Even though his abilities have atrophied a bit since his resurrection he’s still one of the greatest fighters in his universe. It’s never really demonstrated that he has any powers, but the game does hint at certain things. He most likely has some form of superhuman resilience since he is supposed to be an immortal pirate who has come back from the dead. 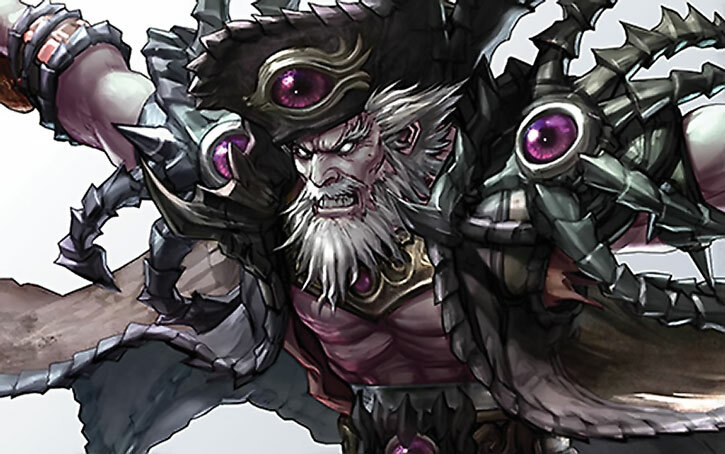 Likewise it’s never demonstrated that he can animate corpses, but he is seen commanding undead pirates on several instances. This could be an actual power of his. Or it could just be a side effect of his contact with the Soul Edge, since the sword typically has the mysterious power to do whatever makes the plot work. Like most pirates Cervantes isn’t exactly a very nice person. But there was generally a sound reasoning behind his hatred. He was embittered by his father’s death, but also saw piracy as a lucrative business to amass great amounts of wealth. He only attacked merchant ships and villages that couldn’t properly defend themselves and generally stayed off the radar. That’s not to say that he was unheard of. For instance he had gained enough of a reputation to get hired by Verci to find the Soul Edge. However, that all went out the window when the Soul Edge possessed him. Like most he fell completely under the sway of the sword’s nihilistic tendencies. He started pillaging for the sake of wreaking murder and havoc rather than an ends to a means. Even when he was resurrected the sword still had its hooks into him. Thus, he continued to do the dirty work of harvesting souls. This time around it wasn’t completely impulse driven. He had determined that his body would eventually decay if he didn’t continue to reap souls. He was even smart enough to realize that stealing his daughter’s soul was a valuable prize. This value was created by her cursed lineage and connection with the Soul Edge. Once Cervantes fell under the sway of the demonic blade he never looked back. But over time he did grow a bit more reasoned in how to best go about his new job. Cervantes could probably be inserted as is as a one time opponent of any mid-range hero or group. For some reason I’m thinking more Silver Age , but he could easily be thrown into a darker more modern horror story. Immortal, Iron Nerves, Languages (Spanish), Lightning Reflexes, Rich Friend, Schtick (paired swords). Age (Old), Creepy Appearance (Ghostly undead appearance and white eyes), CIA (Soul Edge), SPI (obsession with the Soul Edge and sociopathic tendencies), Catastrophic Rage, Fatal Vulnerability (not harvest souls i.e. killing people and collecting fragments of the Soul Edge), Misc. Cervantes is basically an undead zombie and there are likely a few other Drawbacks to go with this. See the section below for more explanation. Legendary Soul Edge [BODY 06, EV 06, R#00 Flight: 01 for the blade only and not the wielder]. This is the big one. It is the ultimate sword that drains the souls of its victims and takes over the life of its wielder, forcing him to commit unspeakable crimes. As stated this sword is one of the focal points of the entire universe and thus has attendance to do whatever the hell it feels like just to say screw you cause it can – oh yeah, and as the obligatory plot device. Learn more in Nightmare’s entry. Soul Edge (Female) [BODY 05, EV 05, R#00 Flight: 01 for the blade only and not the wielder]. Cervantes managed to partially renew Soul Edge before Soul Calibur 2. He originally had it and went on a 20 year rampage with it, but it was broken and stolen. For more on Soul Edge, see Nightmare’s wu. Nirvana [BODY 04, EV 04, R#00 Projectile weapons: 03, Ammo: 01, Long reload time and is also subject to black powder fouling rules R#04]. Nirvana is an unusual weapon that has a gun in its hilt – which fits his intimidating fighting style. It, along with Acheron, was recovered from Cervantes’ ship, the Adrian. Both weapons have slightly higher stats are they are considered masterworks. Acheron [BODY 05, EV 05, R#00]. Acheron (pronounced Ack-ur-on) is a long sword that is a relic from Cervantes’ plundering pirate days. It was stored in the Adrian, until Cervantes recovered it after losing Soul Edge. Whooh boy! Cervantes odd mix of Advantages and Drawbacks as well as previous stats are going to take a bit of explaining and its best to do it chronologically so. In his first appearance in Soul Blade he had the towering last boss status and was quite a bit more powerful. Up his physical stats to 8/5/6 and add another point to both Martial Arts and Weaponry and he didnt have the Age (old) Drawback. To balance this out his SPI becomes a CPI as he is totally under the sway of the murderous blades and lives for nothing else. He also had Jumping: 01 to represent some of this jump attacks and 100 HP. After SC1 is where his story and stats start to get a little weird. (Hey just like any other resurrection story! I guess comic books dont have a monopoly on poorly executed resurrection stories!). 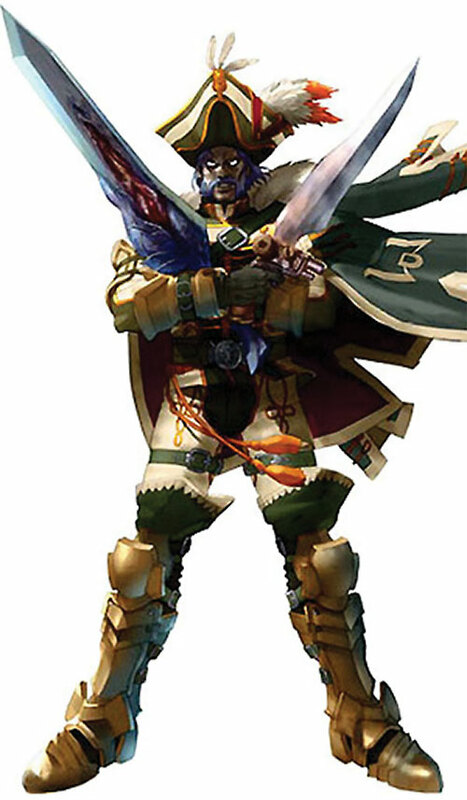 Cervantes comes back to life after Nightmare unknowingly resurrects him due to the shards of Soul Edge that got embedded in his body. At this stage he just wanders around with the vague notion that he needs to get the demonic blade. He’s still fearsome in combat and his stats are the same as they were in the first game, but his mental and mystical stats should hover around 2 as he’s got no memories and only a vague idea of what he should be doing. (Oh yeah, and his eyes glow for some unknown reason.). And in SC2 is where he basically has the above stated stats in this wu and also where the story get a little? confusing. Its stated that after being resurrected from his corpse-like state by the shards in his body that he just returns to life as if he was never killed and starts aging like normal — until he regains his memories at which point he becomes immortal (in an immune to aging kind of way) as long as he is able to power the shards in his body by harvesting souls and by obtaining more shards. The Age (old) drawback is actually supported in game as he isnt a totally unbalanced combat monster that he was in the first 2 games (as well as the slightly lower stats ). 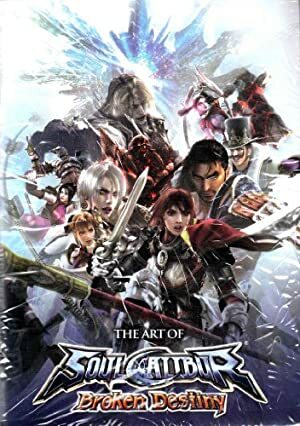 Namco is deliberately vague about some of this, but you can just assume that lots of random peasants get slaughtered off camera a lot because that’s just what happens in the Soul Calibur universe although oddly enough for some unexplained reason needed to seek the soul of his daughter Ivy in the events leading up to SC4. Really this is all probably thinking way too deep into every. The simplest answer for any of this is that Namco decided to bring him back after killing him in first games storyline due to the fact that he had too large of a fan base to ignore and that they would have to scrap a cool and fully developed character. The clearest evidence of this is the fact that he doesnt appear in the arcade version of SC1, but is later made an unlockable largely unchanged character in the home version. After that he got toned down to a somewhat diminished and not overly powerful just kind of hangs around and has very little interaction with all the other characters. Likewise his Rich Friend is a guess. Cervantes cares little for money and is likely to steal whatever he needs, but like any real pirate he’s always got loot from his decades of pillaging stashed somewhere so whenever he needs supplies or another sword he’s always got a back up. At several points it’s shown that Cervantes has a crew of zombie pirates to assist him. They get very little screen time, but its highly likely that theyre just run of the mill zombie thugs. Creepy Appearance, CIA (serving Cervantes), Cannot Heal, Misc. They’re mindless and utterly loyal to Cervantes and don’t really take initiative on their own. Mystical stats can only be used to make Intimidation attempts and from whatever meager defense from mystical attacks. Other Drawbacks that zombies might have are also possible, but not demonstrated.